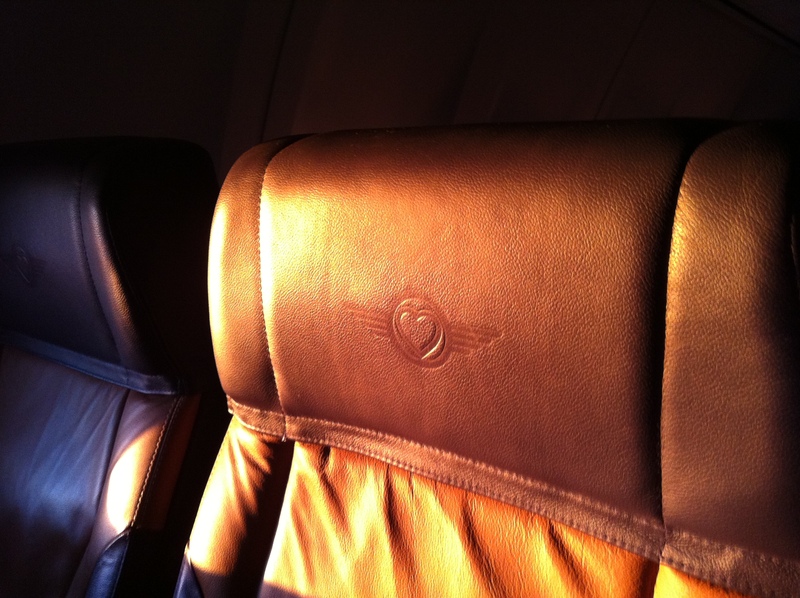 ← In-flight Advertising: Opportunity or Nuisance? Fast forward many years later. 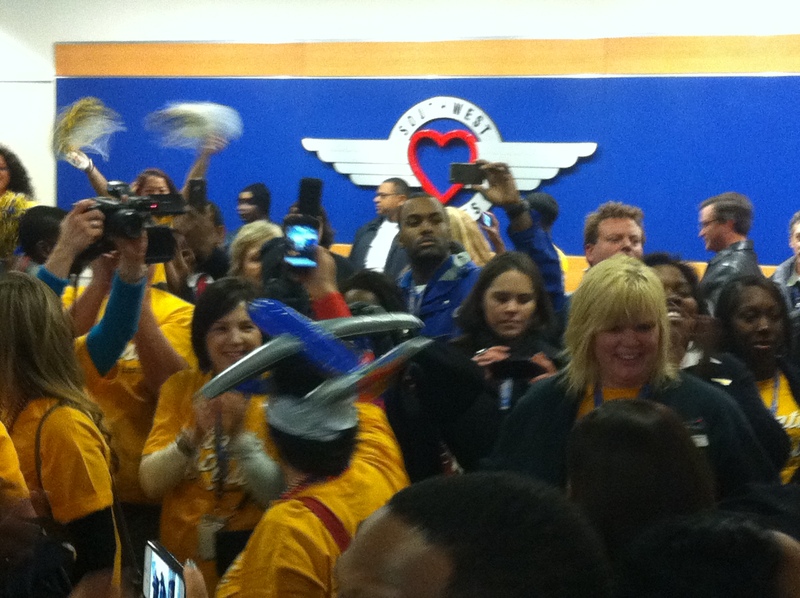 Southwest FINALLY arrives in Atlanta. February 12, 2012. 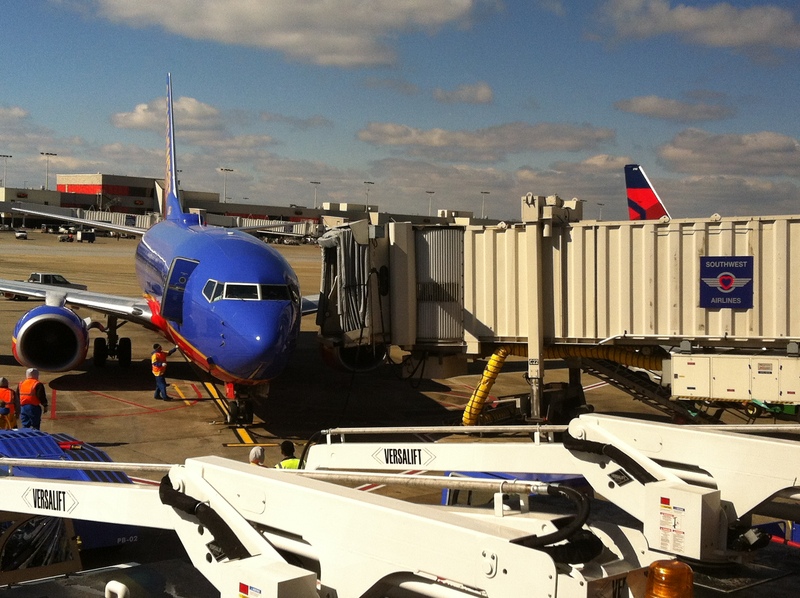 Today, however is February 11 and I’m at C20 at Hartsfield-Jackson Atlanta International Airport awaiting the arrival of Southwest aircraft from Dallas. Streamers are being strung. Employees are hugging each other. There are agents with Pom Poms. The fire trucks are in place for a water cannon salute. Lots of excitement, cheers, and energy. You would think the arriving customers were celebs. 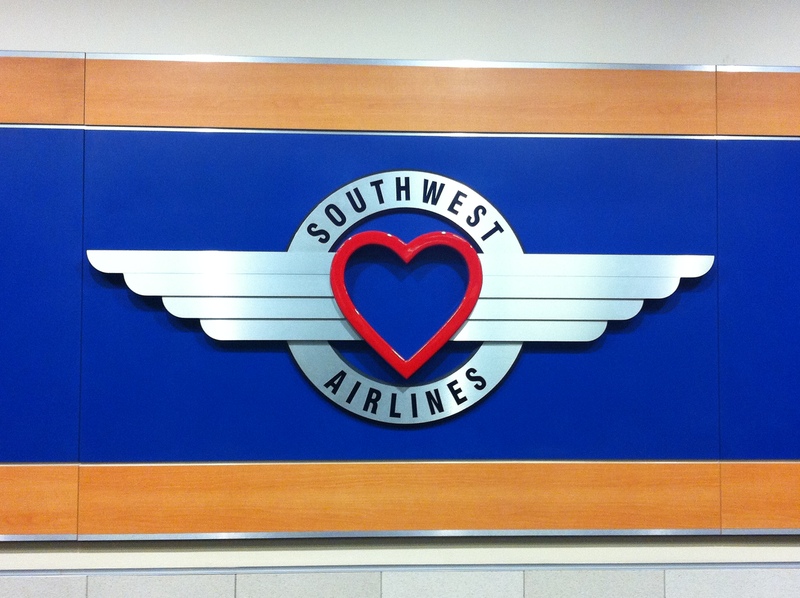 In the world of Southwest, they are. Local media, aviation bloggers, and curious onlookers are out in full force. Cameras are flashing. Interviews are being conducted. Talk about making a grand entrance. 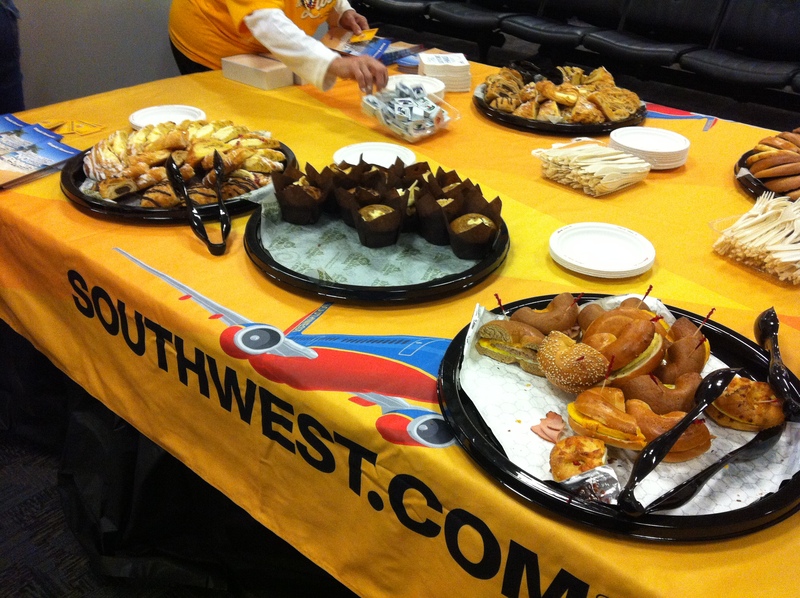 Then again, when has Southwest ever done anything without a lot of energy? 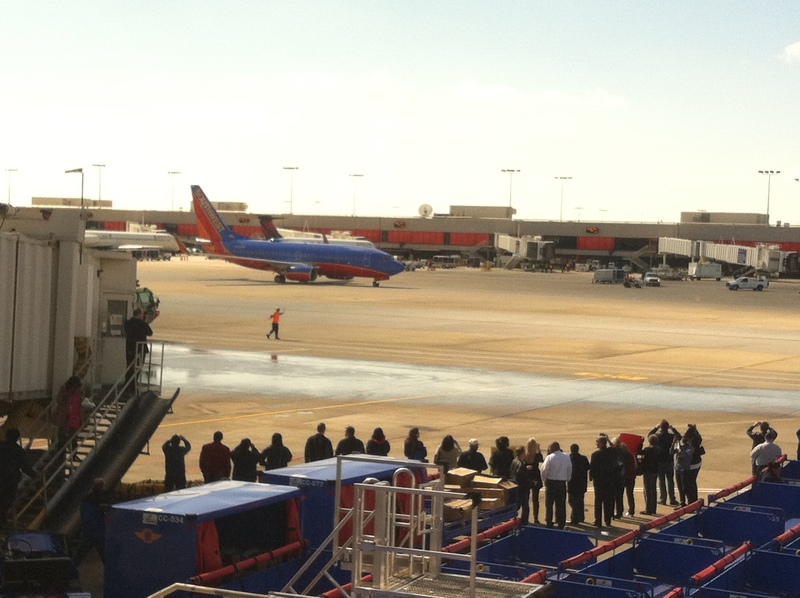 When the first plane arrives, it becomes a reality: Southwest has finally made it to Atlanta. Later that evening we attended the “Atlanta At Last” celebration. In essence it was a “pub crawl” of 4 downtown restaurants/bars. Each restaurant offerered locally brewed Sweetwater beer and various appetizers ranging from sushi to pizza. We pub crawled to the 4 different pubs and crawled back again meeting employees, fellow aviation bloggers, and fans of the airlineguys. 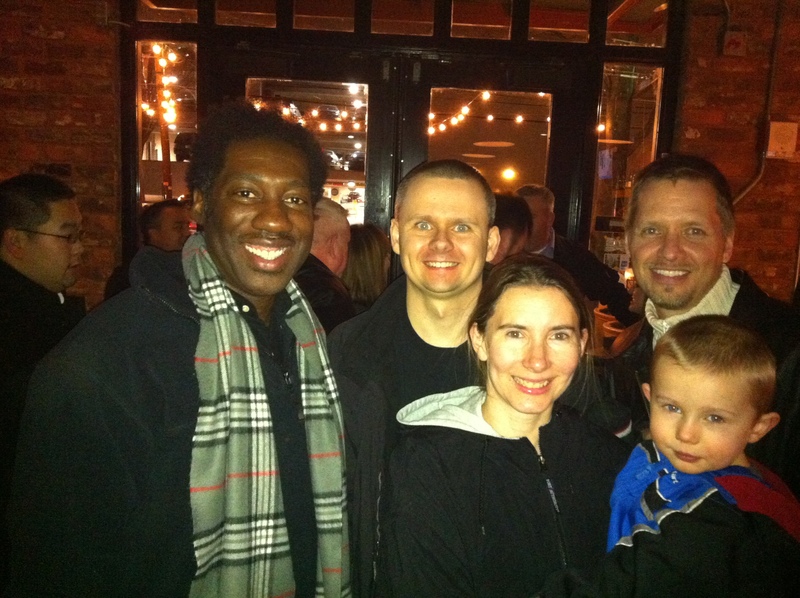 A very memorable meet up was with Tim, Holly, and Mark. I had met Tim and Mark earlier at the airport celebration. This was there 9th Southwest station opening; and they don’t even work for Southwest! Talk about the ultimate avgeeks! Mark, their young son (3-4 years old), has taken over 300 flights already! 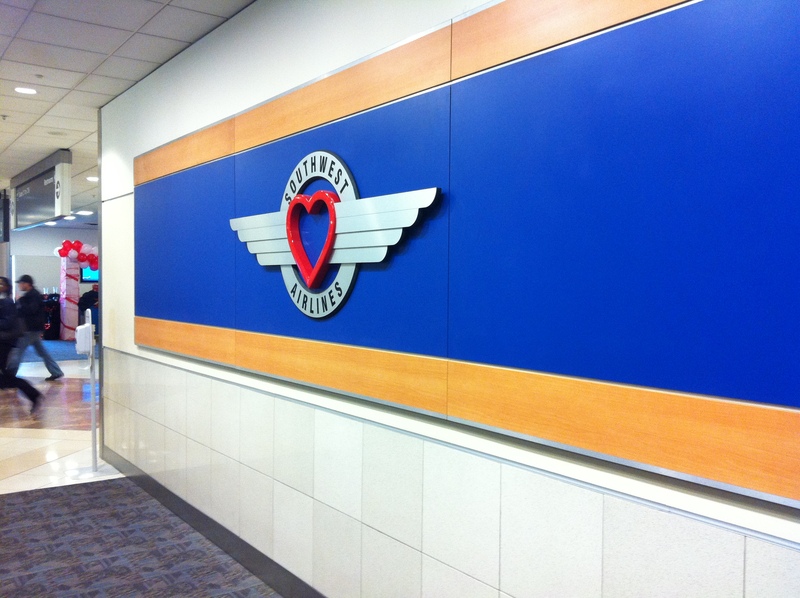 Wished we could have stayed longer and met more Southwest employees but had to leave to be up and ready for 6am departure to Baltimore: the first Southwest flight to depart Atlanta. 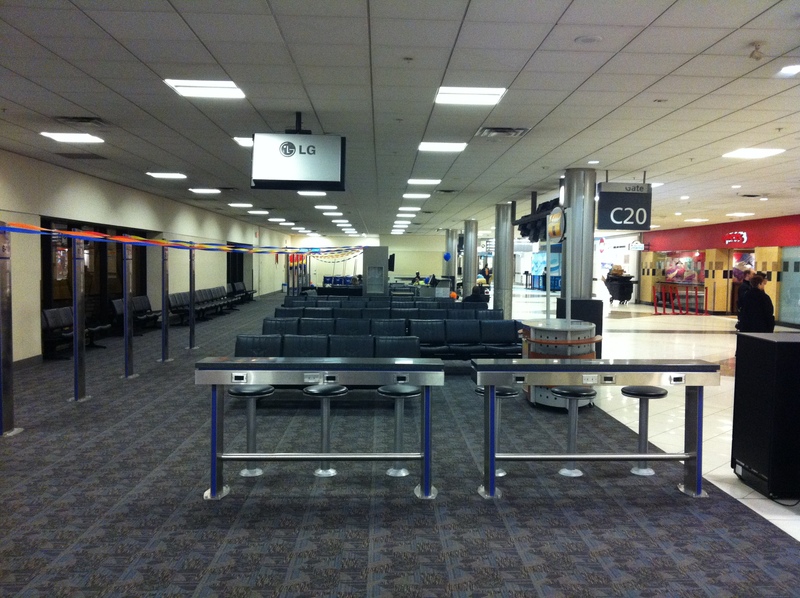 I arrived at the gate at 4:45am and there were 4 others waiting. All I could think about was how early a 6am departure felt to the body. Maybe it was the Sweetwater beers. Out of nowhere, and within a few minutes, there was a flurry of activity. Employees were showing up and tables were being set up. Things were kicking into gear. 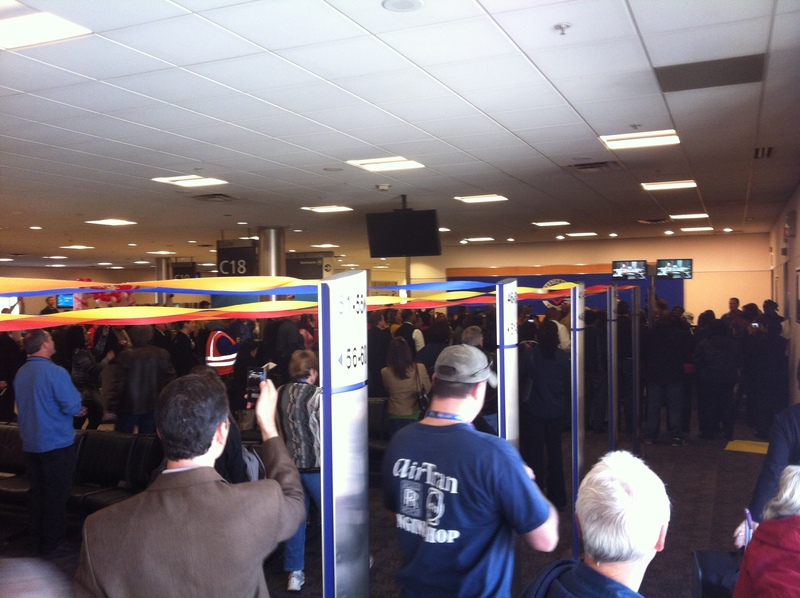 The gate area then became very busy. Coffee was brewed (thank goodness). Pastries were set out. And the gate agent began playing a trivia game with the customers. The agents working the flight were very kind to explain the open seating boarding process, and that we were on the first flight to depart Atlanta. Boarding was very orderly. 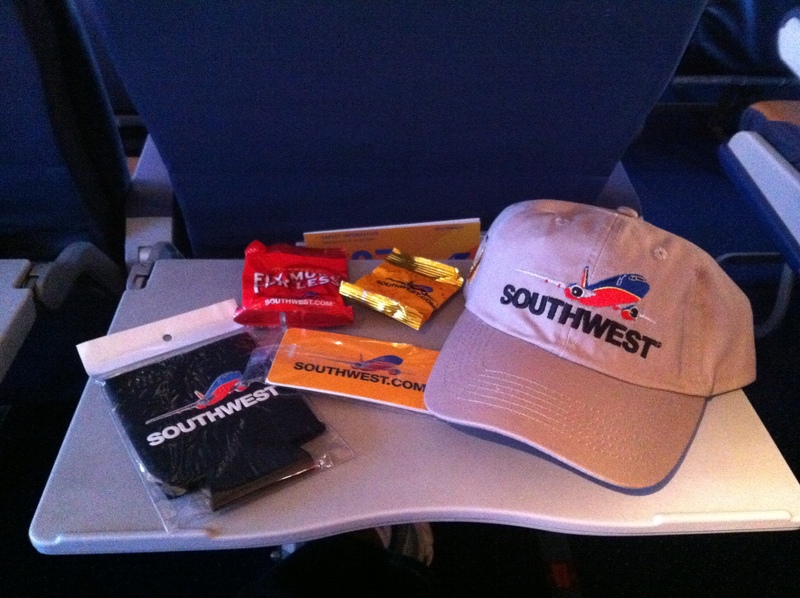 We each received swag bags containing peanuts (of course), a luggage tag, beverage koozie, and a Southwest ball cap. One lucky customer got free roundtrip tickets in his swag bag. Surprisingly, the plane was pretty empty. The BWI agents were rocking. Funny. Worked well as a team. Made upbeat and personable announcements. There was even a guy in the gate area who proposed to his girlfriend. By the way, she said yes. The return flight was pretty full. 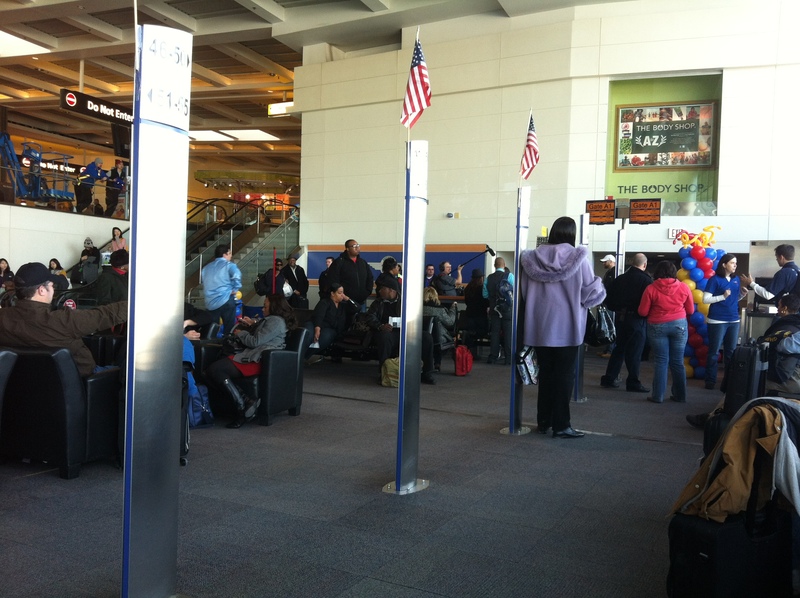 Again the agents took the time to explain how things worked for those unfamiliar with open seating. 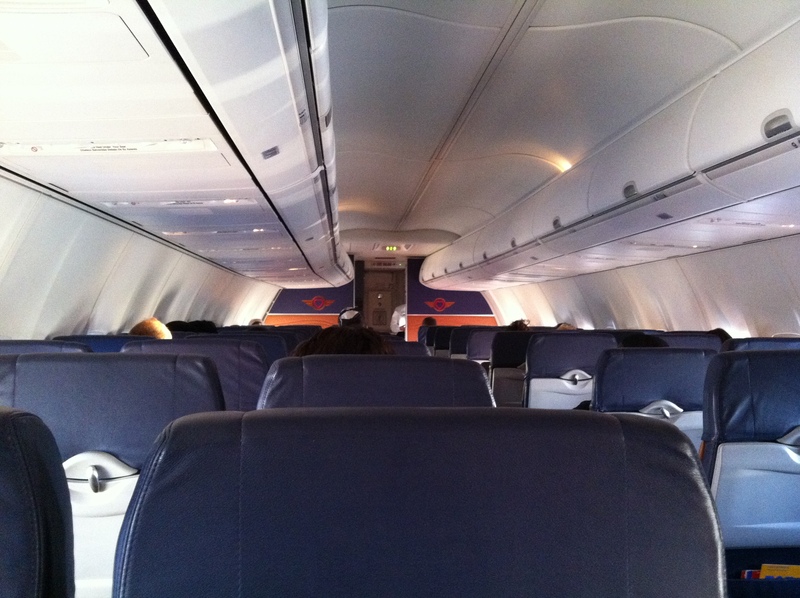 I wasn’t sure if I’d like open seating boarding, and I’m still unsure, however we boarded on time and departed early. Open boarding worked well on this flight. 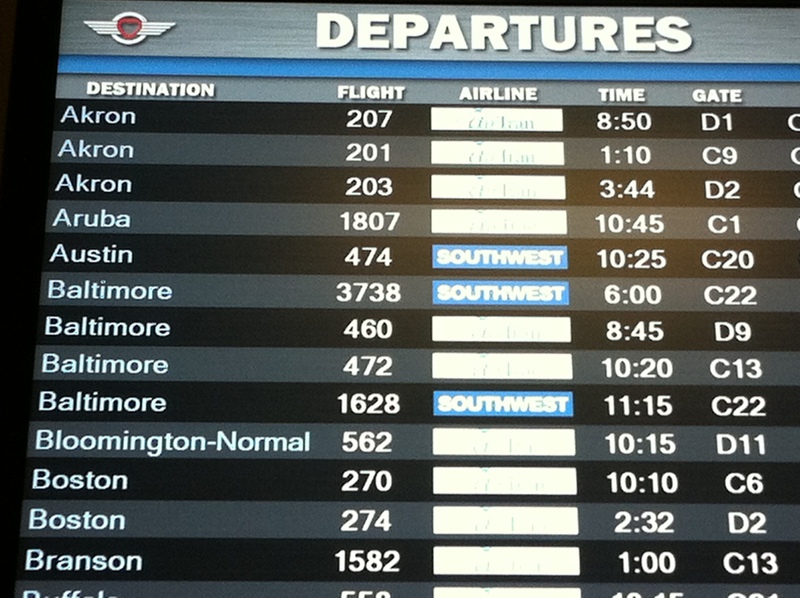 Then again, I was in the A Group for both flights. The return crew was young, smiled a lot, and were very professional. No jokes. No one-liners. Just lots of smiles and good eye contact. 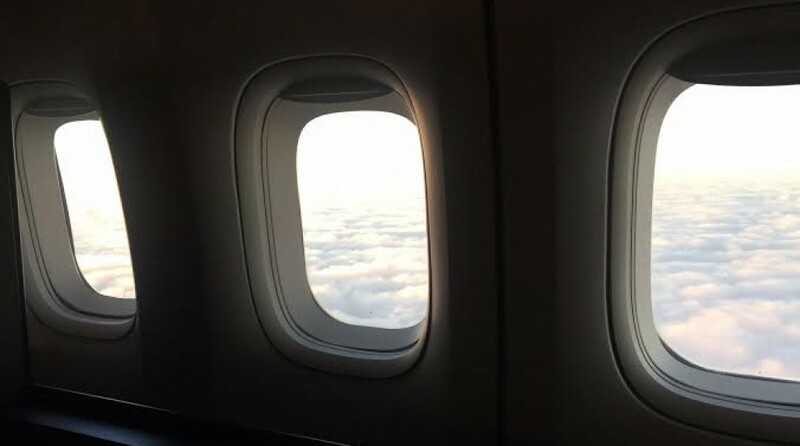 And they constantly checked on the passengers throughout the flight. 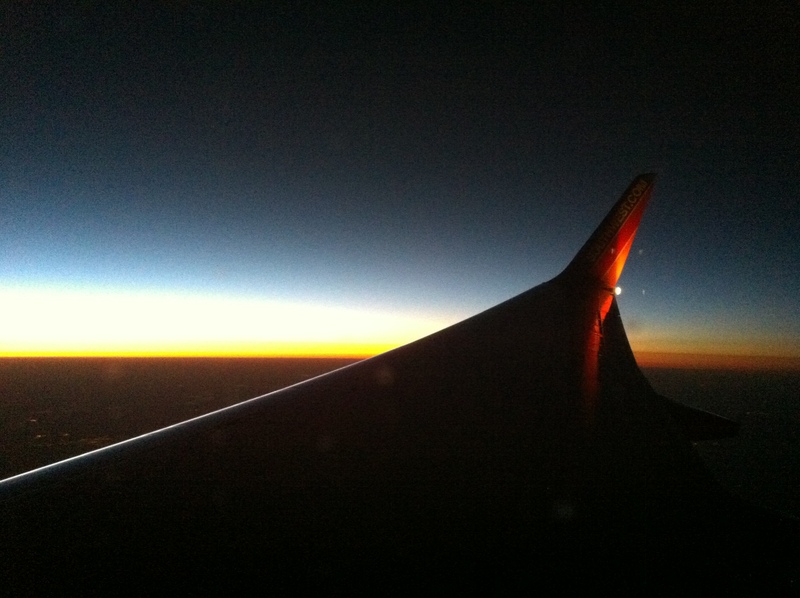 All in all the flight was smooth and uneventful. 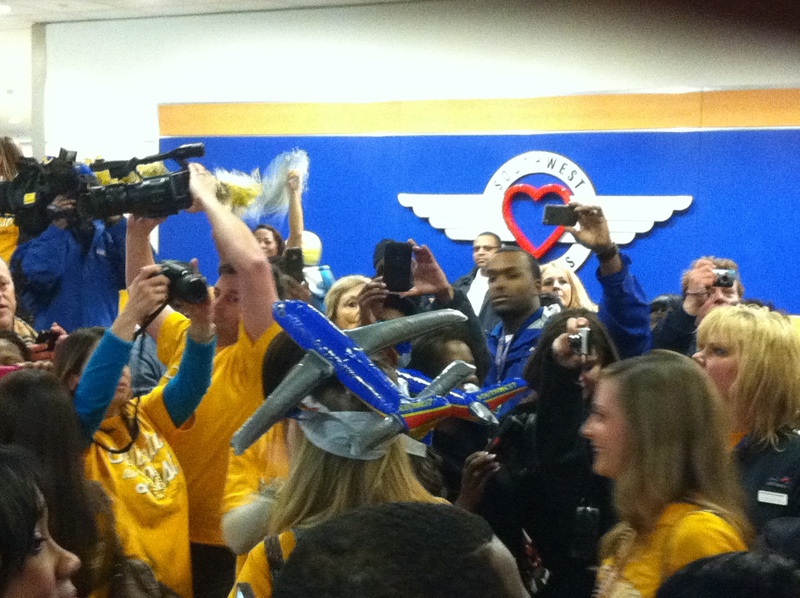 We arrived back into Atlanta on time and to a gauntlet of cheers and high fives from the ground crew. As I walked through the terminal I saw “9 Southwest station openings” Tim again! We chatted for a minute. He told me he had visited our website and had enjoyed the stories we had written thus far. As I walked away I thought, “How cool!”. Here’s someone so totally dedicated to Southwest that he and his family would come from Pennsylvania to Atlanta to attend the station opening. 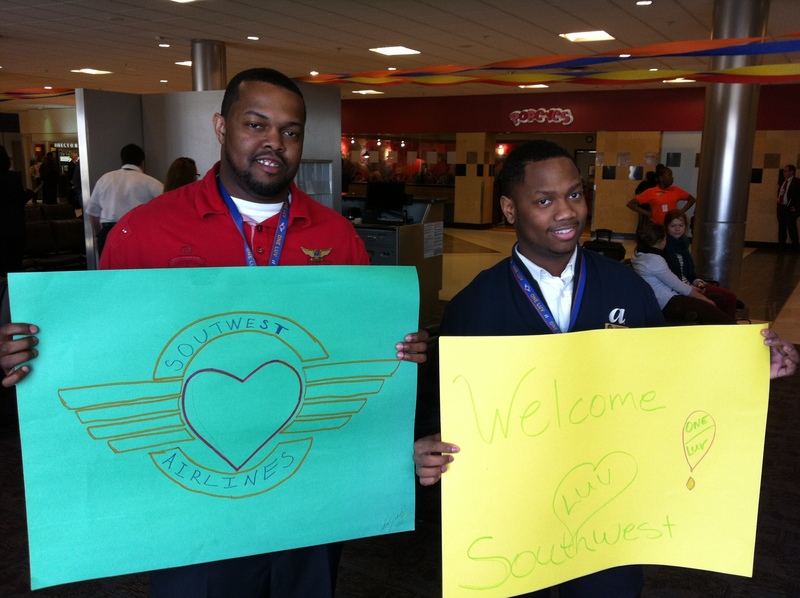 Southwest appears to have that effect on people, airports and communities around the US. Atlanta’s a mature market though; and with anything that’s mature, accepting new experiences can be a challenge. 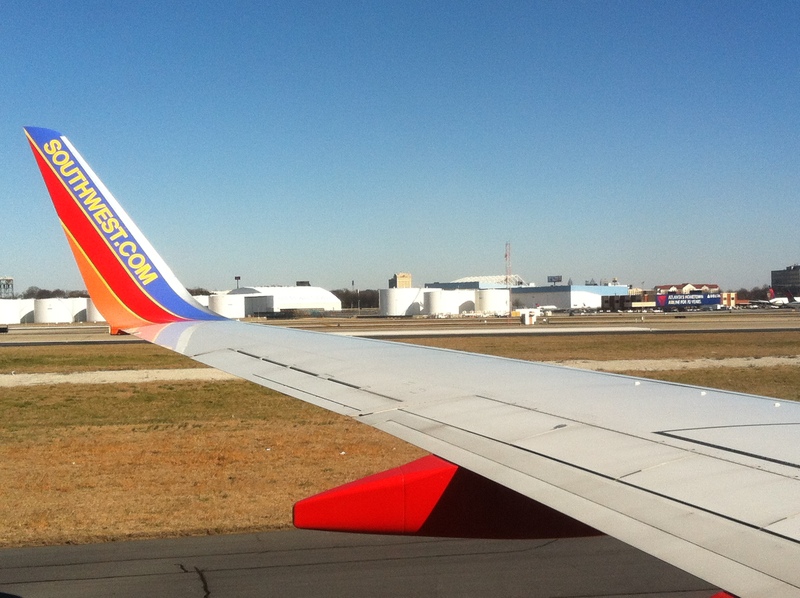 We’ll continue to monitor Southwest’s progress as they grow their operation in Atlanta and will keep you posted. Speaking of experiences we hope you enjoy our experiences as we see them. We invite you to visit our site soon and often to hear the latest. 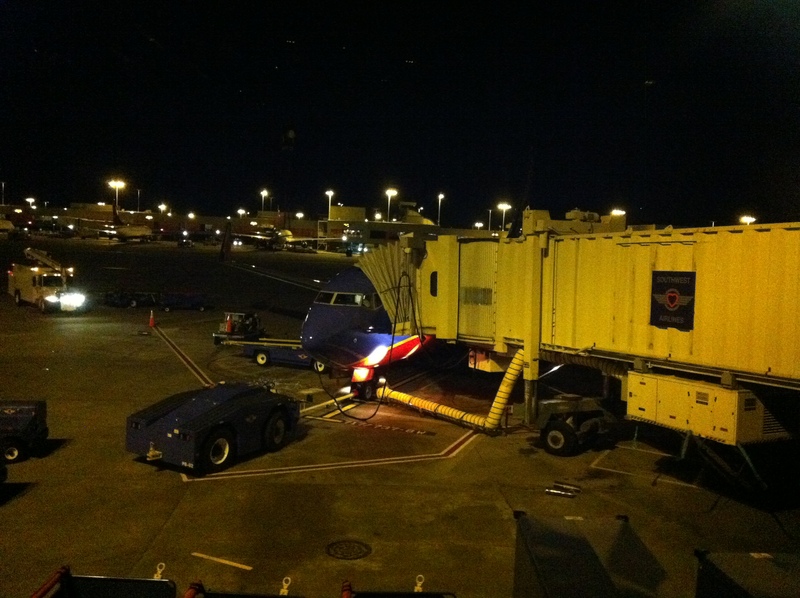 This entry was posted in Uncategorized and tagged airlines, atlanta international airport, avgeek, aviation, aviation friends, flight attendants, hartsfield jackson atlanta international airport, southwest airlines. Bookmark the permalink.